On Saturday, September 1, 2012, Sandos Playacar visited the local Mayan villages of Lo-Bel and Carrillo Puerto in the rural area of southern Quintana Roo. Our mission was to bring household items, such as clothes and shoes, donated by our Sandista staff to these indigenous communities. Lol-Be and Carrillo are in Chemax Municipality of Yucatan Mexico, approximately three hours from Playa del Carmen. The total population is 630 inhabitants, the majority of which are children. Most members of the communities live in traditional indigenous households, or palapas, which are handmade from local wood and palm leaves. They do not have toilet facilities inside their homes, and the majority of homes, as is traditional in the Yucatan, have dirt floors and consist of one room that houses an entire family. Community members wash their clothes by hand and typically cook on an open fire. Only one of every 25 households has a television. Public services are very limited in these communities. A doctor visits for review and consultation every 10 days, but emergencies cases are treated with traditional medicine and transfered to the town of Valladolid due to a lack of basic facilities. Both of these communities offer kindergarten for children, but there are no local primary or secondary schools available in these towns. Habitants have few schooling options and the majority do not complete their education past the primary level. 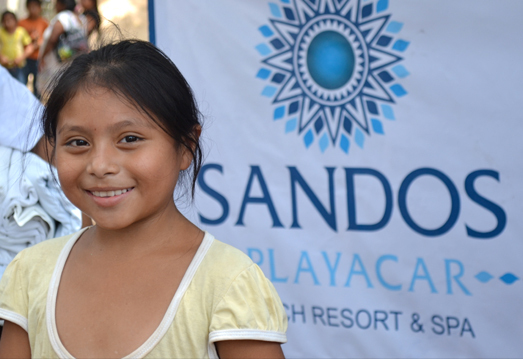 Sandos Playacar Beach Resort & Spa is grateful to all of our Sandista staff members who donated items and voluntarily worked extra hours to support this project. These donations make a difference in the daily lives and health of these communities. In keeping with our commitment to sustainable tourism, we hope to build a lasting relationship with Lo-Bel and Carrillo and plan to provide more information about how guests at Sandos Playacar can support this project by donating key items.